The South is distinctive in its customs, food, and even dialect and accent. More than any other regional group, people born and raised as Southerners tend to think of themselves as Southerners all their lives, no matter where they live. By most geographic definitions, the northern border of the South is marked by the Ohio River and is straddled by the nation's capital, Washington, D.C. In alphabetical order, the states in this region are Alabama, Arkansas, Florida, Georgia, Kentucky, Louisiana, Mississippi, North Carolina, Oklahoma, South Carolina, Tennessee, Texas, Virginia, and West Virginia. Some people also consider Maryland part of the "South." The population of the Southern United States is made up of many different peoples who came to the region in a variety of ways, each contributing to what is now called "Southern cooking." American Indians, native to the region, taught European settlers to grow and cook corn, a grain unknown in Europe at the time. Spanish explorers in the 1500s brought pigs with them, introducing pork to the region. West Africans carried some of their traditional foods with them, such as watermelon, eggplant, collard greens, and okra, when they were brought to the United States by force as slaves beginning in the 1600s. Creoles, known for their unique use of spices, are descended from French and Haitian immigrants who later mingled with Spanish settlers in the New Orleans area. "Cajuns,"
also recognized for their unique style of cooking, were originally Acadians, French settlers in Nova Scotia who were driven out by the British in 1755 and made their way to New Orleans. In Louisiana, crawfish (resemble miniature lobsters) and catfish are popular, prepared in dozens of different ways. Fried catfish is popular all across the South. Texas's spicy and flavorful "Tex-Mex" cuisine reflects the state's close proximity to the spicy cuisine of Mexico. The American Civil War (1861–1865) had a major impact on the South and its food. Many plantations and farms were destroyed during the conflict. To survive, Southerners ate whatever they could grow or find, and nothing went to waste. When the economy began to recover, most African Americans were not allowed to share in the newfound wealth and continued to eat the simple foods that were available during the war. This type of simple and inexpensive food became known later as "soul food." The first African American, and the only ex-slave, known to have written a cookbook was Abby Fisher. Her book, What Mrs. Fisher Knows About Old Southern Cooking , was published in 1881 and includes many recipes that would now be considered soul food. No one knows for sure how chess pie got its name. Although there are many recipe variations, all have eggs, sugar, and butter in the filling, and many contain buttermilk. Melt the butter and add the brown and white sugar to it. Stir well to combine. Add other ingredients and stir gently to mix. Do not beat the mixture. Pour into unbaked pie shell and bake for about one hour, until a knife inserted in the center comes out clean (with no custard sticking to it). Place veal bones in a large pot with ½ gallon of water. Boil the water and veal bones until the water is reduced by half the amount. Put the turnips in the pot with the bones and boil until the turnips are soft. Pour off the liquid, then add salt and pepper to taste. Serve hot. Because kitchens only had wood-burning stoves in the late 1800s, recipes did not give baking temperatures or times. Bakers simply had to guess how long something would take to bake and keep checking it. Even if they had baked something many times before, the fire could be hotter or cooler each time, so baked goods had to be checked frequently to make sure they did not burn. 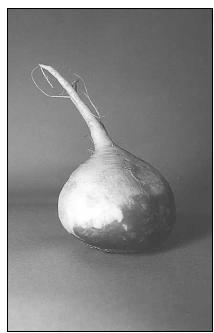 The turnip, popular for generations in the South, is the main ingredient in Old-Fashioned Turnip Soup. European settlers by American Indians. Another staple food in the South is pork, originally brought to America by Spanish explorers in the 1500s. Chitterlings (pronounced CHIT-lins), made from pig intestines, were traditionally seen as a "poor person's" food, but have recently begun to appear in fine restaurants. Barbecued meat, usually pork, on a grill is a Southern tradition. Besides grits, most people also think of southern-fried chicken when they hear "Southern cooking." Traditionally served for Sunday dinner, fried chicken has become a stereotype of Southern food, popularized by Colonel Sanders' Kentucky Fried Chicken. Other meats, such as steak, are also "chicken-fried" in the South by breading and frying them. Cornbread, made from cornmeal, is typically eaten with a Southern meal. Okra, black-eyed peas, and collard greens are all common Southern-grown vegetables that were brought to the region by African slaves. The name for meat stew, gumbo, often thickened with okra, comes from a West African word for okra, quingombo . Jambalaya, a pork and rice stew from the Creole and Cajun New Orleans region, takes its name from the French and Spanish words for ham: jambon and jamón , respectively. Crawfish, catfish, and shrimp are enjoyed all across the South. Favorite desserts in the South include chess pie, sweet potato pie, pecan pie, key lime pie, and watermelon, which is also the most popular melon in the United States. Combine cornmeal, flour, baking powder, sugar, salt and baking soda in large mixing bowl. Add ¼ cup oil, buttermilk and eggs, stirring with a wooden spoon until just mixed. In a medium-sized skillet with an oven-proof handle, add the 1 to 2 tablespoons oil and heat until very hot. Quickly pour the batter into the hot skillet, and with a potholder, transfer the skillet to the oven. Bake for 20 to 25 minutes or until golden brown and center springs back when lightly pressed. Best served warm. Rinse the chicken under running water. In a plastic bag, combine the flour, salt, and pepper and shake until well blended. Place a large cast-iron skillet on the stove at moderate heat. Fill the skillet half full of melted shortening and add the bacon grease. Dip some of the chicken pieces into the milk and then put them in the plastic bag. Shake vigorously to coat evenly. Remove the chicken pieces from the bag, shake the excess flour back into the bag, and then arrange the pieces in the hot oil, making sure not to crowd the pan. Fry 15 to 20 minutes until golden brown and crisp, turn over with tongs, and reduce heat to low to moderate, frying another 15 minutes until golden brown. Drain on another paper bag or paper towels. Repeat the procedure with the rest of the chicken pieces, adding shortening and bacon grease, if necessary. Brown the sausage in a skillet over medium heat. Remove from the pan and set aside. Season the chicken with salt, pepper, and Creole seasoning, and brown quickly in the remaining sausage grease in the frying pan. Remove the chicken and carefully discard the grease. In a large pot, heat the oil over medium heat and add the flour, stirring constantly. This roux (sauce) should become a dark reddish-brown color. Add the vegetables and stir quickly. Continue to cook, stirring constantly, for about 4 minutes. Add the stock, seasonings, chicken, and sausage. Bring to a boil, then cook for about 1 hour, skimming fat off the top as needed. Add the chopped onion tops and parsley, and heat for 5 more minutes. Serve over rice in large, shallow bowls. Combine the ingredients and mix well with a wooden spoon. Use to season dishes such as chicken and sausage gumbo (see recipe). (To cook sweet potatoes, peel them and chop into small chunks, then boil until soft, about 25 minutes.) Mix mashed sweet potatoes, sugar, and margarine until creamy. Pour into piecrusts and bake for 1 hour. Most US Southerners are Christian, for whom the main holidays are Christmas and Easter. It is a longstanding tradition in the South to make fruitcake for Christmas. The Claxton Fruitcake Company in Georgia sells more than 200 tons of fruitcake each year. The typical main dish for both holidays is ham. Southerners are known for their country ham, a hindquarter of a year-old hog that is preserved with either salt or sugar, smoked, and then aged for a year or more. Another Christian holiday that receives special treatment in the South is Mardi Gras (French for "Fat Tuesday"), the day of feasting before Lent begins. New Orleans is famous for its Mardi Gras celebration, which lasts several days and involves parades, balls, music, and lots of food. One traditional element of the feast is the King Cake in which a small figurine or dried bean is baked inside. Whoever gets the piece with the figurine in it is crowned king or queen for the day. Preheat oven to 375° F .
Measure 4 cups flour and mix with baking soda. Combine fruit, coconut, and nuts and mix with remaining 1 cup flour in a separate mixing bowl. Cream the butter, sugar, and milk together. Beat in flour and baking soda mixture gradually, switching to a wooden spoon or spatula if batter becomes too stiff for the electric mixer. Stir fruit, coconut, and nut mixture into batter. Drop by teaspoonful onto greased cookie sheet. Preheat oven to 325° F .
Add milk and about ½ cup of flour. In a large bowl, blend butter, sugar, salt, and eggs. Add yeast mixture and mix thoroughly. Gradually add 2½ cups of flour to make a stiff dough. Place in a large greased bowl and brush with melted butter. Cover with a damp cloth and allow to rise until double in size, about 3 hours. Use 1 cup or more of flour to knead dough and roll into a 4-foot long rope. Form into an oval on a 14- × 17-inch greased cookie sheet, connecting ends of the rope with a few drops of water. Press the figurine (or bean) in the dough from underneath. Cover with a damp cloth and let rise until double in size, about 1 hour. Bake for 35 to 45 minutes or until lightly browned. Brush top of cake with corn syrup and sprinkle with colored sugar. The main meal of the day in the Southern United States used to be at midday and was called "dinner." The smaller evening meal was referred to as "supper." In recent years, the main meal has moved to the evening, though most Southerners still call it "dinner." During the 1800s, the era of large plantations, guests would often come to visit for days or weeks at a time. Hospitality is very important to Southerners, and hosts prepare huge meals for their guests. A dinner menu from the mid-1800s may have included five kinds of meat, cucumbers and tomatoes, hot rolls, and five different desserts, plus three beverages. The African slaves did not share in this abundance of food, but lived on small amounts of salt pork, cornbread, and hominy (corn mush), plus whatever greens they could grow themselves. 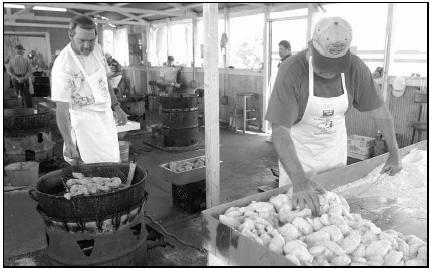 Two Tennessee cooks prepare kettles of fried catfish at the World's Biggest Fish Fry held over four days in Paris, Tennessee. Nearly 12,000 pounds of catfish were fried during festival. This meager diet became the basis for what is known today as "soul food." Southerners' favorite beverages are iced tea, usually loaded with sugar and called "sweet tea," and soft drinks, many of which were invented in the South. Coca-Cola was developed in 1886 in Atlanta, Georgia. Pepsi was created 10 years later in North Carolina. Dr. Pepper first appeared in Waco, Texas, in 1885, and Mountain Dew was first produced in either Virginia or Tennessee around 1961. Other Southern-made soft drinks include Royal Crown Cola, Nehi fruit-flavored drinks, Barq's root beer, and Gatorade. The South continues to be the largest consumer, as well as producer, of soft drinks. In the 1990s, North Carolina was the number one soft-drink consumer of the 50 states with over 50 gallons consumed per person per year. Other snack foods native to the South include corn dogs (hot dogs breaded with cornmeal), pralines (almond or pecan clusters), and the Moon Pie (a chocolate-coated marshmallow sandwich cookie), invented at the Chattanooga Bakery in Tennessee in 1917. Put hamhocks or neckbones in large pot of water. Boil for about 1½ hours, adding more water as needed. If using fresh greens, rinse well. Stack greens and roll together. Slice rolled greens into thin strips. Add salt, cover, and cook for 30 minutes over medium heat, stirring every few minutes. When greens are tender, serve with slotted spoon so liquid drains out. Sprinkle hot sauce on greens, if desired. Bring 3 to 4 cups water to a boil. Add baking soda and tea bags to the water. Allow to set for 10 to 15 minutes. Pour into a gallon pitcher and add sugar. Add cold water to make 1 gallon. Preheat oven to 275° F .
Combine the sugar, flour, and salt in a mixing bowl. Beat egg white until stiff in a separate bowl. Add vanilla extract to egg white. Fold in flour mixture and pecans. Cool and remove cookies from sheet. People living in the Southern states generally receive adequate nutrition in their diets. Traditional Southern cooking is high in fat and calories, and many modern Southerners are striving for a healthier lifestyle, reserving the delicious fried and sugary foods for special occasions and celebrations. Southern teens and adults are slightly more likely than people from other parts of the United States to smoke cigarettes. This is due in part to the role tobacco farming has played in the economies of such states as Kentucky, Tennessee, Virginia, and North and South Carolina. Edge, John T. A Gracious Plenty: Recipes and Recollections from the American South . New York, Putnam, 1999. Edge, John T. Southern Belly: The Ultimate Food Lover's Companion to the South . Athens, GA: Hill Street Press, 2000. Egerton, John, Ann Bleidt Egerton, and Al Clayton. Southern Food: At Home, on the Road, in History . Chapel Hill: University of North Carolina, 1993. Hayes, Isaac. Cooking with Heart and Soul . New York: Putnam Publishing Group, 2000. Lundy, Ronni. Butter Beans to Blackberries: Recipes from the Southern Garden . New York: North Point Press, 1999. Miller, Joni. True Grits: The Southern Foods Mail-Order Catalog . New York: Workman Publishing, 1990. Reed, John Shelton, and Dale Volberg Reed. 1001 Things Everyone Should Know about the South . New York: Doubleday, 1996. AnythingSouthern.com: The Online Gateway to the South. [Online] Available at http://www.anythingsouthern.com (accessed April 12, 2001). Chitterling Site, The (or The Soul Food Site). [Online] Available at http://www.chitterlings.com (accessed April 12, 2001). Civil War Interactive. [Online] Available at http://civilwarinteractive.com (accessed April 12, 2001). CooksRecipes.com. [Online] Available http://www.cooksrecipes.com (accessed April 17, 2001). Creole and Cajun Recipe Page, The. [Online] Available at http://www.gumbopages.com/recipe-page.html (accessed April 13, 2001). DixieDining.com. [Online] Available at http://www.dixiedining.com (accessed April 12, 2001). Gritlit.com: More Southern food than you can shake a stick at. [Online] Available at http://www.gritlit.com (accessed April 12, 2001). Grits. [Online] Available at http://www.grits.com (accessed April 12, 2001). Origins of Southern Food, Fall 1996: Applied Anthropology course project at the University of West Florida in Pensacola. [Online] Available at http://www.uwf.edu/tprewitt/sofood (accessed April 11, 2001). SouthernFood.com. [Online] Available at http://www.southernfood.com (accessed April 12, 2001). Southern Foodways Alliance. [Online] Available at http://www.southernfoodways.com (accessed April 12, 2001). Southern U.S. Cuisine. [Online] Available at http://southernfood.about.com/food/southernfood (accessed April 12, 2001). i love this article. My great Grandmother told my the something when I was little. What cooking methods were used by settler? What cooking methods were used y settlers? How did cultural customs and traditions affevt the types of foods and cooking methods used by the settlers? What dishes introduced by the settlers are still typical of this region today? How do dishes typically served in this region today reflect the culture if the people who settled the region?